She has been named Beverly Hills Premier Book Publishing Consultant four years running. 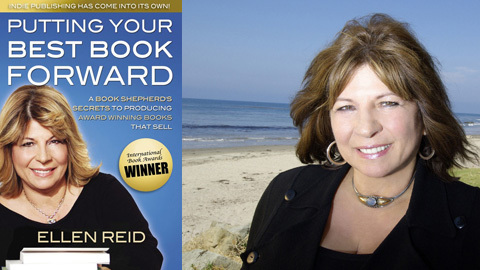 She is the author of the International Books Award book, Putting Your Best Book Forward: A Book Shepherd’s Secrets to Producing Award-Winning Books that Sell. I started my business after attending Dan Poynter‘s Self Publishing Manual seminars in Santa Barbara and studying with him from 1994 on. The seminars were full of writers who were excited about self-publishing their books. Even though they were good writers, they didn’t know what constitutes a good title, subtitle, book cover and all the myriad details of book production and publishing. Dan suggested I become a “book shepherd”. As a “book shepherd” I bring my talent and knowledge of the film and advertising industry and the ever-changing book industry to each client. I have the unique ability of understanding what the writer wants the book to do for them and I can orchestrate the creative team accordingly. Branding is a big part of my work. It’s more than hiring an editor, or book designer. You need a book that is excellent in every way – a book that not only has a vibrant cover, a title that grabs browsers, a subtitle that draws them to the back cover, and back cover text that compels to the sale… but one in which every element works synergistically with the others to supercharge the sales impact. Be kind, books are writer’s babies and it took a long time to write them. I need to be gentle and firm at the same time. I closely guide the custom team I assemble for you to do the work. You end up with an exceptional book whose cover copy (including title and subtitle), design and interior layout reflect the excellence of your message. Why did you join Association for Women in Communications? Since books are a brilliant means of communication and I’m in the communication “business”, it seems a perfect fit. I fell in love with Santa Barbara in 1995 when I came here to attend the Dan Poynter seminars and then in 2000 moved here. I moved to LA in 2007 and stayed there building my businesses and rented a cottage here and went back and forth. One day I realized I was living in the wrong place! I moved here permanently in November 2012. How can members and friends of AWC-SB help? How can I help you all? Let’s get to know each other…I’m happy to be part of the organization and look forward to participating. Phone, text or email? How do you communicate these days and can you comment on each? I like email and of course, text, social media is good for staying in touch but for true communication, I prefer phone. How do you get the word out about your business or projects? I have a website for each of my companies, a freelance social media expert works with me and I go to events. People seem to find me since there is no place I can go, online or off, to find out who has a finished manuscript and wants to indie publish. Anything else we should know about your business and/or you? This entry was posted in Featured Members on March 31, 2013 by Lisa.